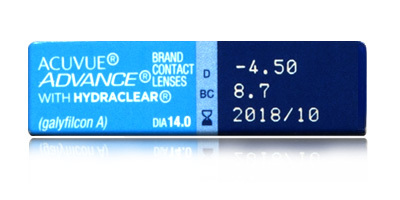 Acuvue Advance lenses are to be discontinued shortly. 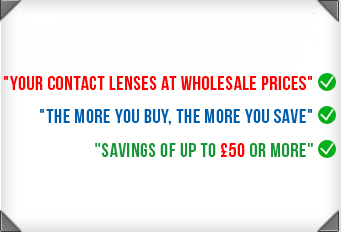 If your lenses are unavailable we will advise you by email. The alternate lens option is Acuvue Oasys click here to view this product. Available in powers from -12.00D to +8.00D, Acuvue Advance two-weekly disposable contact lenses have been developed to give long-lasting comfort, consistent vision quality and great value for money. These lenses are particularly suited to younger wearers in need of a lens that can be worn from breakfast �til bedtime. Six lenses are included in each box. Johnson & Johnson are renowned for producing high quality healthcare products and Acuvue Advance is no exception. Eye health is supported through high levels of UV-A and UV-B blocking (90 and 99% respectively) which helps reduce the potentially harmful effects of the sun�s rays. Johnson & Johnson�s patented Hydraclear hydration system combines durable, soft materials with an effective wetting agent. The result is a smooth and highly wettable lens that provides all-day comfort. 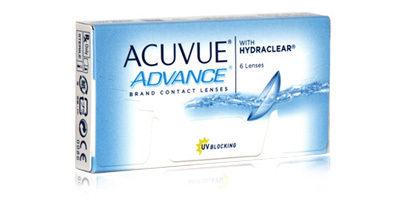 Acuvue Advance contact lenses are made from a breathable silicone hydrogel material called Galyfilcon A, which has high levels of oxygen permeability. Eyes stay constantly moist, white and bright. No more itchy, dry and gritty eyes or blurred vision. 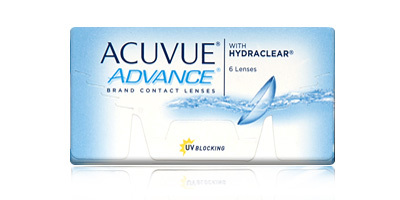 A light visibility tint makes Acuvue Advance contact lenses easy to spot in and out of the blister pack. Meanwhile, the useful inside-out indicator makes application easy, fast and painless. If you�re a first time lens wearer or considering moving from glasses to lenses, these no-hassle two weekly disposables are a great choice. Put them in, forget about them and throw away at the end of the recommended period. Call 0800 037 4000 with any queries regarding Acuvue Advance or for advice on selecting the right contact lenses. Choose between a number of delivery options, including express delivery. Needed to exchange contact lenses - this happened quickly and easily, thank you!